ramen | poor scientist. will blog 4 food. Seriously folks, I am committed to powering through these last few posts about my trip to Taiwan and Japan. Today, I bring you my 3-part meal in Osaka! I arrived around noon but held off on eating real food until dinner time. Boy, was I hungry! I knew I definitely wanted to get takoyaki, or fried octopus balls, an Osaka specialty. But who knew what else was in store? 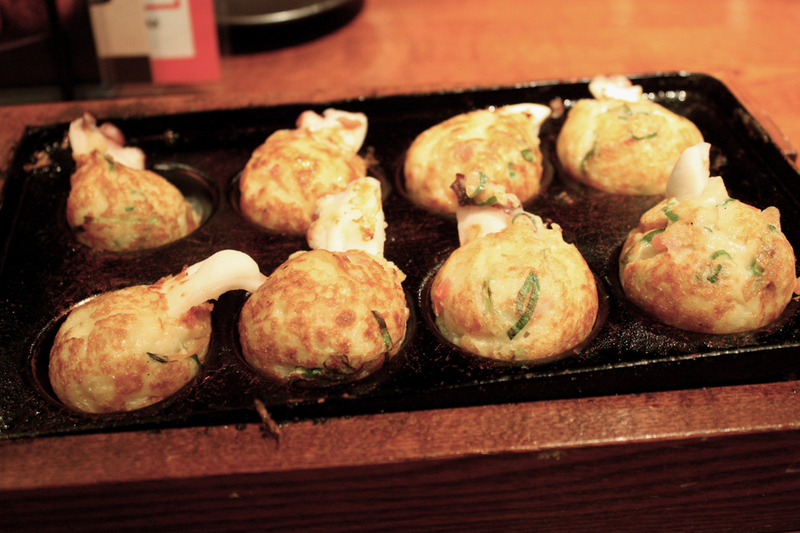 I walked around shinsaibashi for quite a while and came upon a sit-down takoyaki restaurant. A lot of street stalls sell the delicacy, but I wanted to relax and enjoy my octopus balls. Wouldn’t you? This particular restaurant sold the regular takoyaki, as well as the “Bikkuri Takoyaki” or “surprising fried octopus.” What was so surprising? Well, according to their menu, “the pieces of octopus are so big that you’ll be surprised!” Since I had no reference point, I’m not sure I was that surprised, but the pieces of octopus were pretty darn big. Basically, it’s a piece of octopus surrounded by an egg-y batter. You’re supposed to eat it with bonito flakes (not pictured) and dark soy sauce (aka okonomiyaki sauce, pictured). After I coated the takoyaki with bonito flakes, I blew on them to cool them down (they were really super hot)… subsequently, I blew bonito flakes all over the place. It was quite embarrassing but that was part of the fun. Oh, and at first the waiter told me they had run out of beer, which made me quite sad. But then they got more, and he was so excited to tell me, since I was so obviously upset at the lack of beer. It was cute. 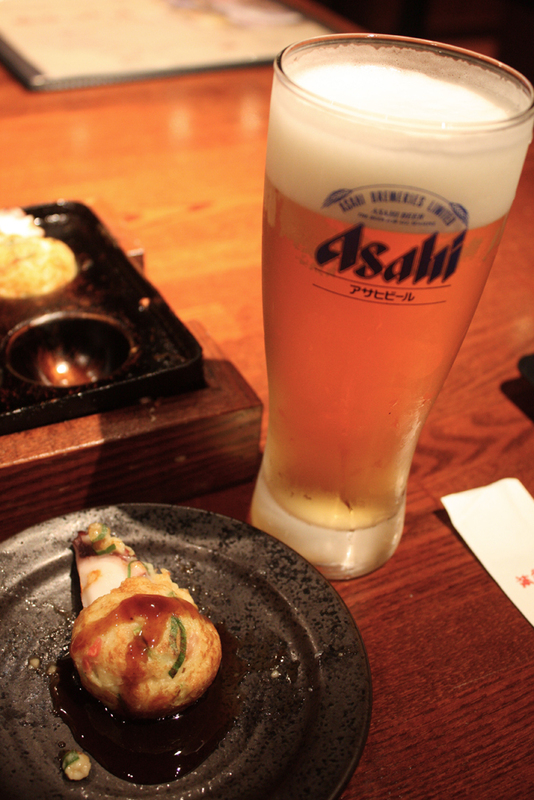 Octopus ball + beer = a nice welcome to Japan. Even though I devoured 8 of the surprisingly large takoyaki and one large beer, I was still really hungry. Then I came upon this food stall selling ramen. Yes! My first noodle encounter in Japan! I checked out how the locals were ordering and realized that I had to buy a ticket from a vending machine. Meat or more meat? 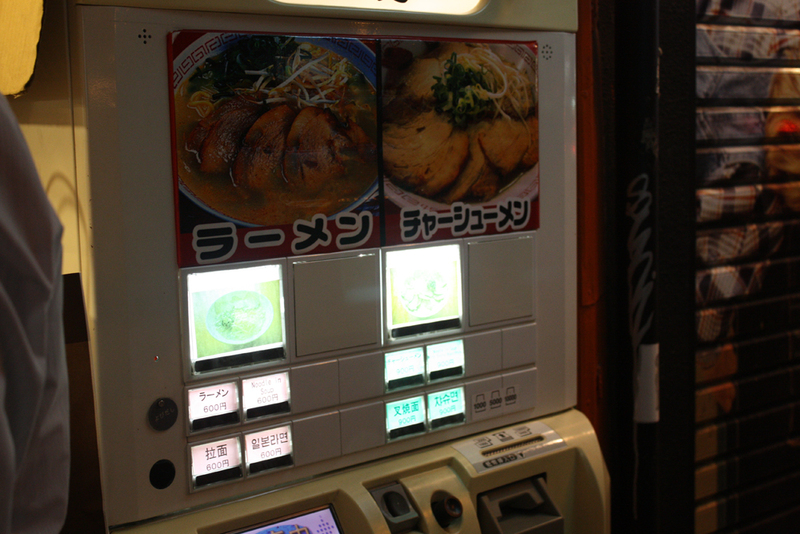 The machine was also quadra-lingual, which is better than just about anyone that might work at a ramen stand. For those who don’t know, Japan is full of vending machines. I swear, there is at least one vending machine per block. They sell everything from drinks to ice cream to ramen. In the case of ramen, you buy a ticket, which you then give to the guy making the ramen. This is genius, because: 1. the guy making the ramen never has to touch money, making things more sanitary; 2. you order exactly what you want, and you don’t even have to talk to anyone (great for tourists); 3. it keeps the employees from accessing/stealing from the register. Ramen guy moves so fast! Three bowls (on the right) ready to be filled with deliciousness. So the procedure went something like this: I went up to the vending machine, put money in, made my selection between regular ramen ($6.50) and one with extra pork slices ($10), retrieved my receipt, gave my ticket to the ramen man, who promptly made me a steaming hot bowl of delicious ramen that I ate standing at the stall. It was AWESOME. 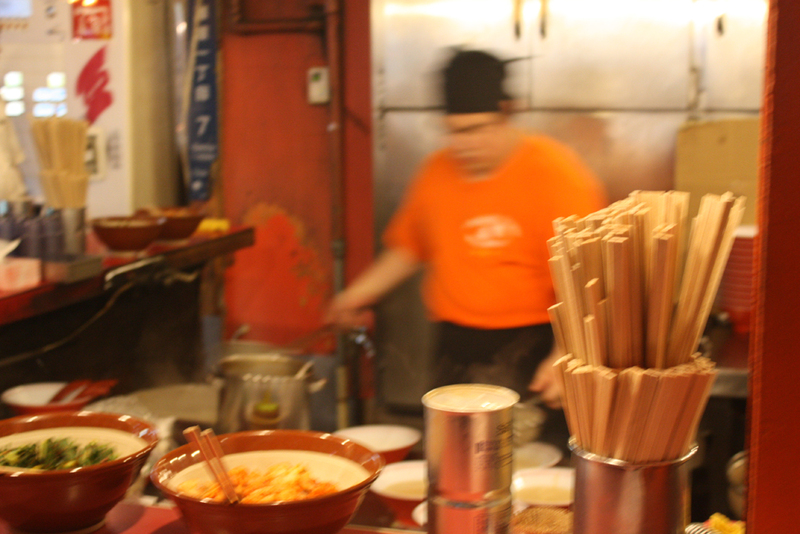 I also loved watching people come up, place their orders, and slurp down the noodles in about 5 minutes flat. 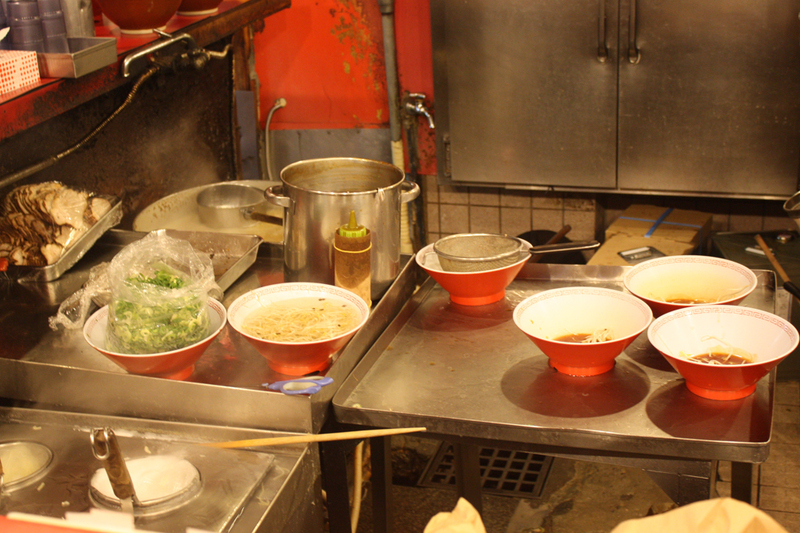 Like at many ramen places here and abroad, there were lots of condiments including the special ramen pepper, hot sauce, and even spicy chives and pickles. Another thing you should know about Japan is that they are really good at making those fake food molds. So, I saw a whole display case full of crêpes with various fillings, and I decided that I must have one. We all scream for ice cream. In a crêpe. I went with a crêpe filled with chocolate almond ice cream and whipped cream. 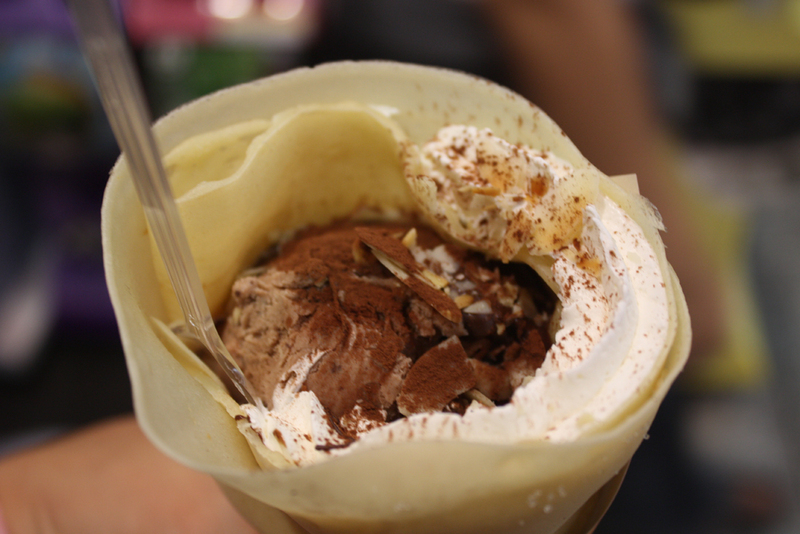 The ice cream was good but the crêpe was just so-so. Also, I got a lot of strange looks from people as I was eating it. Then I realized that the Japanese seem to frown upon walking and eating. 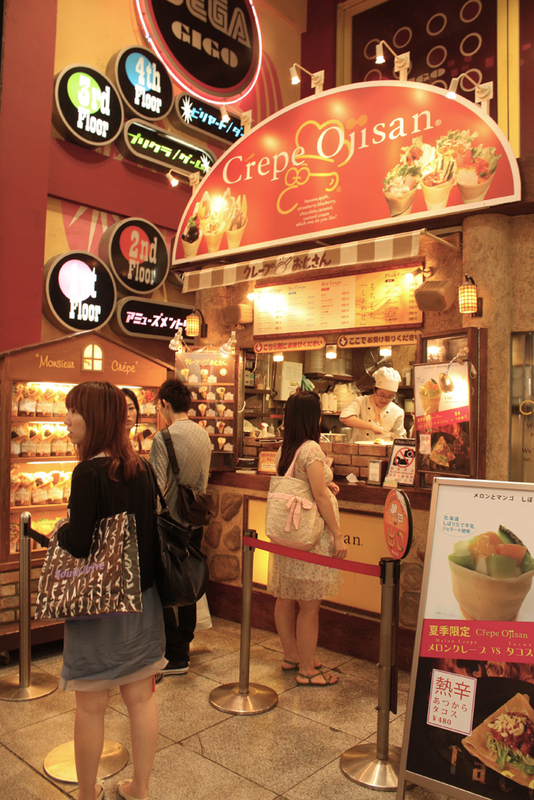 Apparently, just standing on the side of the Crêpe Ojisan to eat your food is preferable. I guess they think it’s vulgar to be moving and eating at the same time, or perhaps you can’t possibly truly enjoy your food on the go. Such a different mentality than in the States! 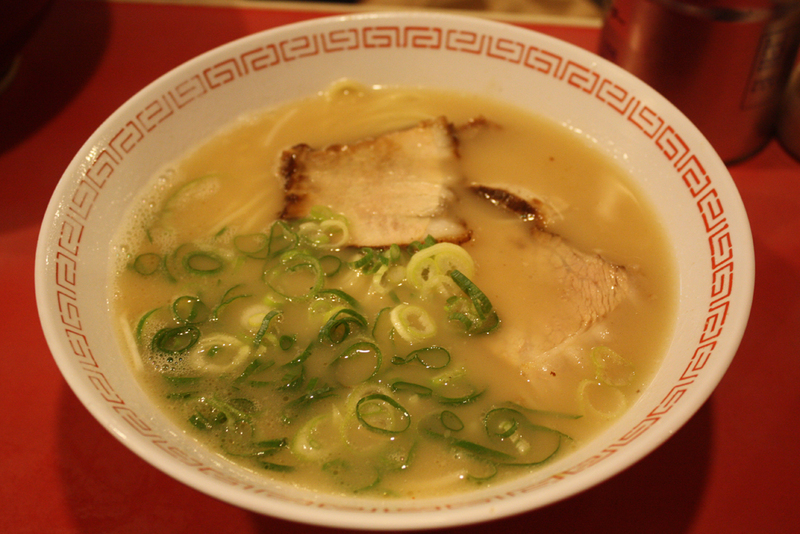 Categories: photos, travel | Tags: ice cream, Japan, Osaka, ramen | Permalink.